Edited by Professors Jürgen Basedow, John Birds, Malcolm A. Clarke, Herman Cousy, Helmut Heiss and Dr. Leander D. Loacker, the second expanded edition of “Principles of European Insurance Contract Law (PEICL)” has just been released. The updated volume is based on no less than 15 years of cooperative research in the field of cross-border insurance law, which was initiated at the Max Planck Institute for Comparative and International Private Law (Hamburg) under the guidance of Director Prof. Dr. Dr. h.c. mult. Jürgen Basedow, LL.M. (Harvard), and involved legal scholars from 14 Member States of the European Union as well as Switzerland. 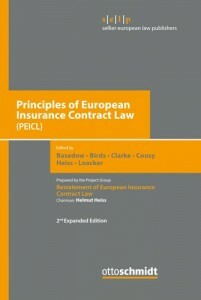 In 2009, the Project Group “Restatement of European Insurance Contract Law” first published the Principles of European Insurance Contract Law (PEICL), which provided model rules for a common European insurance contract law in the form of an optional instrument. While the first edition set out provisions regarding general insurance law, the new expanded volume also covers rules on liability insurance, life insurance and group insurance. In addition, the book contains translated versions of the PEICL rules in Chinese, Czech, Dutch, French, German, Greek, Hungarian, Italian, Japanese, Korean, Polish, Portuguese, Serbian, Slovak, Spanish, Swedish and Turkish. For further information, please see the publisher’s website here.